He is now in fantastic physical shape and his favorite activity continues to be playing catch and jumping for his Chuckit! balls — last count, there are 6 in and around the house. He is so physically exuberant when out in the yard, he races across the yard, twirls with excitement, and even jumps in the air to catch the balls (see video below). You can easily take the ball or other objects away from him and he has a soft mouth when taking treats. He is such a sweet boy. He continues to roll-over happily often. 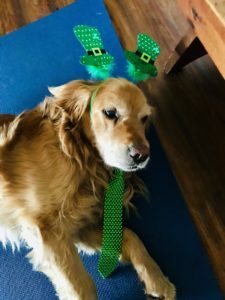 Whether it is time for a walk and he is waiting to get his harness on, or he is coming in from the yard and needs his paws wiped, or it may just be for a belly rub. We have learned that he wants to let us know all is good with whatever you need to do. He also likes to sometimes snuggle with his humans on the couch (often half on and half off – lol). When he paws you, saying, “don’t stop” it melts your heart. 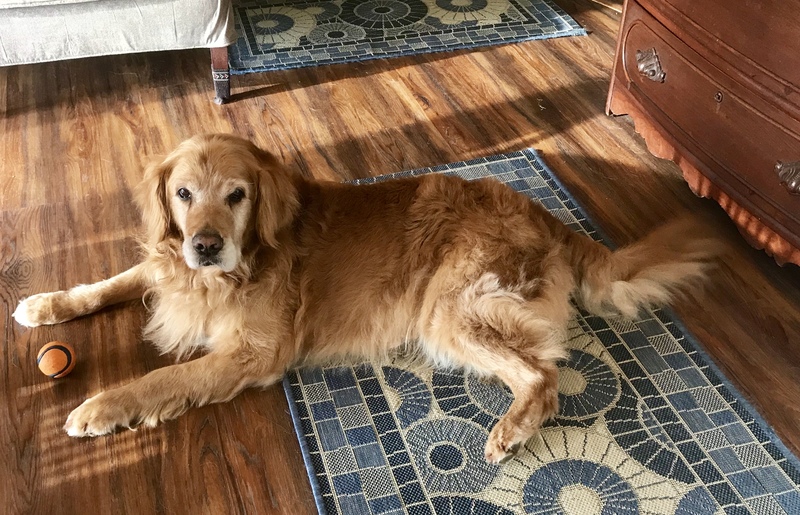 Jay is a perfect mix between a attention seeking golden, and I’m ready to relax (he often puts himself to bed at night). Jay now comes almost all the time when called in from the yard (“treat” is music to his ears), he knows sit, down, over, and crate up (that is to his room not a crate), and is doing better with wait. For the most part Jay always listens exceptionally well and wants to please you. He is certainly better behaved than his stubborn foster sister. He absolutely respects everything in the house and is reliable up to 8 hours (or more — we have not tested beyond 8), he rides well in the car, and he greets everyone nicely in our home (ages infant to adult) and on our daily walks. He is friendly to the dog on the other side of the fence, and has now met one new dog on our daily walks (she was a very submissive lab) and he is always a perfect gentleman. 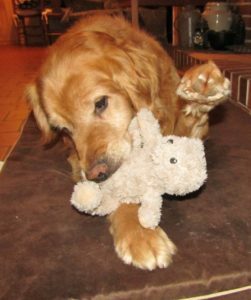 Cats are still an unknown, and like most goldens he will chase a rabbit or squirrel if they get in his yard. Jay still eats and sleeps separately from the girls because that is his den, and 99% of the time everyone lives in perfect harmony. 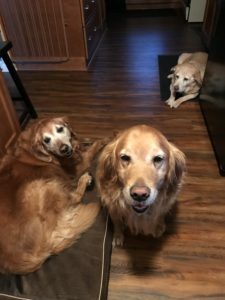 Otherwise, he and his two foster sisters have open access in the home and to each other and all sit in a row to get treats and wait patiently together at feeding times. Since Jay really doesn’t know the art of play, his foster sister and he sometimes cross signals, and a squabble breaks out, and on rare occasion at night, when he doesn’t want to share a toy or for her to get attention from the humans, he will let her know he is not happy. We can almost always intervene and prevent these squabbles. Otherwise, they do everything together and Jay and his older foster sister also do well together and never have issues (she is very submissive and they have figured each other out). 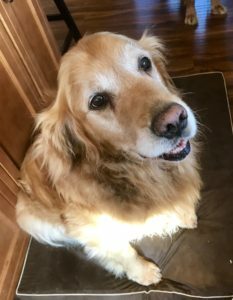 Jay’s health is fantastic and his Vets agree! He had his last dose of Panacur in early March and is now parasite free and is a perfect 70 lbs. 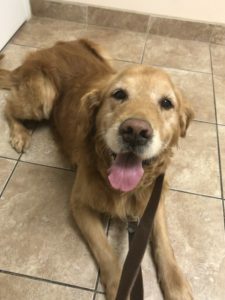 Everyone at the Vet just loves him and he is always a perfect Golden boy there and at the groomer. I recently bathed and groomed him at home and he great too! 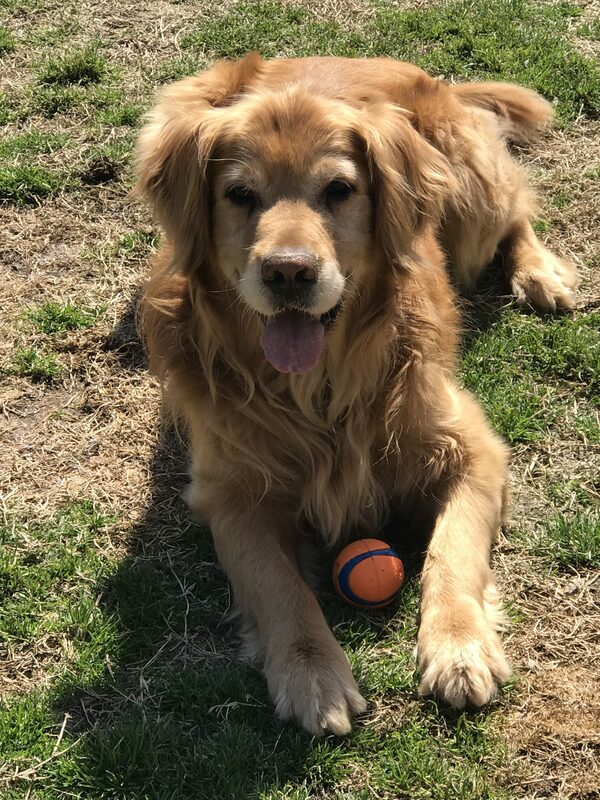 Jay would really like a home where he can be the only dog, and he needs a physically fenced yard so his new family can keep him extra happy with lots of ball throwing and retrieving. 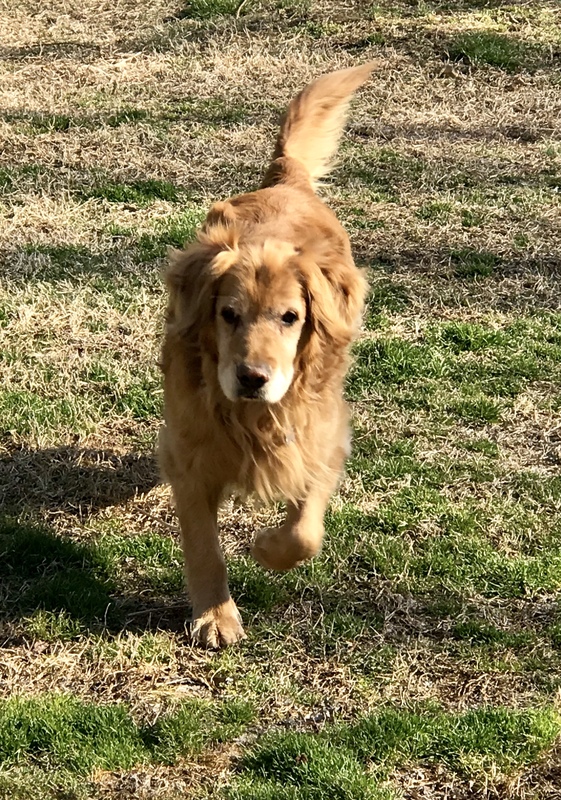 If it sounds like he could be the golden boy for you, you are an Approved GoldHeart adopter, and you want to hear more about this special boy, please contact me (his foster mom) at lovesgoldens13@gmail.com. Jay is being fostered in Chester, MD. If you are not yet approved by Goldheart, and are in our SERVICE AREA, please complete an adoption application at https://goldheart.org/adopting-a-golden/adoption-application/. There is a $30 non-refundable application fee that must be received before the approval process starts. The approval process can take 6 weeks or more since we rely on an all-volunteer support network to process your application, conduct the home visit, and check references. 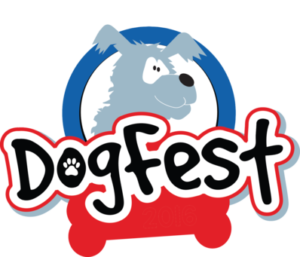 If approved, you can then inquire about JJ, or any other available dog that is looking for a forever home. Thank you for your patience and understanding.